However, that wasn’t actually the deal. At the end of the ad there is a pretty big caveat hiding in the fine print: the “outfits and accessories are sold separately”. Well, as someone who has been to a Build-A-Bear workshop, I can tell you that the outfits and accessories are about three quarters of the total cost. If I remember correctly, the “base animals” cost around $15 while the customizations add up very quickly and represent the balance of the $50-$60 that you end up paying at the register. Based on the ad, a parent of a three-year-old child may have perceived the discount to be 94% ($50 all the way down to $3) however, in actuality the discount (taken only off the base animal) would have only been $12 ($15 – $3 = $12) or 24% off the end price (assuming the end price is $50). There’s a giant difference between a 94% discount and a 24% discount and that’s why, I believe, they had so many folks show up. If they had billed this as a “24% off” sale, I don’t think they would have had a problem. 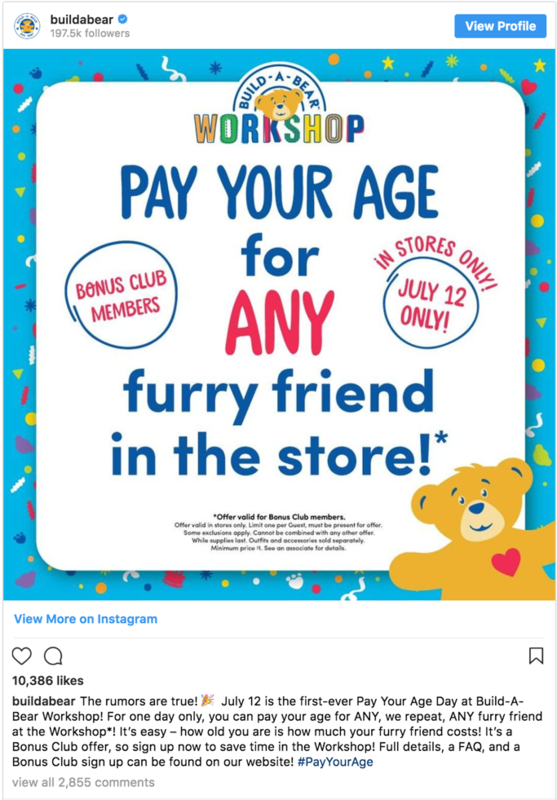 After the failed promotion, Build-A-Bear announced they would issue $15 vouchers for families who came to the event and were turned away. I would not be surprised if there is backlash from their customers over the apology vouchers. Based on my math above, $15 off is actually a better deal than the “pay your age” deal, but I bet that some customers will still be expecting the 94% discount they thought they were going to get on Thursday. An important lesson: when it comes to price, perception is often more powerful than reality. ← Hey – Do you want to invest in Bitcoin?